This story was updated at 6:15 pm ET. A new Japanese space probe is poised to launch toward Venus tohelp solve the enduring mysteries of the hellish, cloud-covered world, whichhas been often described as Earth's twin. But the ambitious spacecraft willhave to wait for better weather on Earth. The Venus Climate Orbiter Akatsuki, which means "Dawn" inJapanese, was slated to launch from Tanegashima Space Center in Japan today ona 2-year mission to study the weather and surface of Venusin unprecedented detail. But low clouds and foul weather prevented its plannedliftoff at 5:44 p.m. EDT today, though it was early Tuesday morning local timeat the launch site. A new launch target was not immediately available. "Oncewe can explain the structure of Venus, we will be able to better understandEarth," said Akatsuki project scientist Takeshi Imamura in a statementreleased by the Japan Aerospace Exploration Agency (JAXA). "For example,we may discover the reasons that only Earth has been able to sustain oceans,and why only Earth is abundant in life." Imamurahas called Akatsuki"the world's first interplanetary probe that deserves to be called ameteorological satellite." The probe carries five different cameras to study Venus' clouds aswell as map the planet's weather and peer through its thick atmosphere to viewthe surface. It will join Europe's Venus Express already in orbit around theplanet, and has scientists on that mission eager as well. "Venus somehow transformed from a more Earth-like place tothe alien place it is today, and what's fascinating about the world is figuringout how it diverges from the Earth and the history behind why thathappened," said David Grinspoon, curator of astrobiology at the DenverMuseum of Nature and Science and an interdisciplinary scientist on the VenusExpress mission. "It could help us understand how things here mightchange." Oneof Akatsuki's main goals is to understand what may be the biggest mystery ofVenus — the "super-rotation" of its atmosphere, where violent windsdrive storms and clouds around that planet at speeds of more than 220 mph (360kph), some 60 times faster than the planet itself rotates. "There's no consistent model of Venus's climate that canreproduce this super-rotation," Grinspoon explained. "We've beentaking general circulation models from Earth and tweaking them for Venus, andthey don't work. By understanding better how climate works on Venus, it willmake us better understand how climate change on Earth works." Akatsukiwill monitor Venus in the infrared to learn more about the atmosphere andsurface under the murky clouds, hopefully revealing what mechanism is drivingthis super-rotation. ButImamura has said his team is fully prepared to be surprised by unexpectedfindings which may uncover more questions than answers. "Wemay be pleasantly surprised by the emergence of a greater mystery than super-rotation,"he said. The Venus Express spacecraft the European Space Agency launched in2005 intriguingly found evidence of lightningon the planet, even though none should exist. "What creates lightning on Earth is water droplets and icecrystals in clouds, which leads to the separation of electric charges thatlightning needs, and you don't have that kind of weather on Venus,"Grinspoon said. But Venus is covered with thick clouds of sulfuric acid. "Maybethere's a kind of weather we haven't seen yet on Venus that causes thislightning, or maybe how we're wrong about the kinds of conditions needed tomake lightning," he added. Akatsukishould help capture vital clues about this lightning with a camera dedicated tophotographing it. Thereare unusual stripes in the upper clouds of Venus dubbed "blueabsorbers" because they strongly absorb light in the blue and ultraviolet wavelengths.These are soaking up a huge amount of energy — nearly half of the total solarenergy the planet absorbs. As such, they seem to play a major role in keepingVenus as hellish as it is, with surface temperatures of more than 860 degrees F(460 degrees C). "We don't know what they are," Grinspoon said. "They're probably some kind of sulfur compound, but we haven't been ableto nail it down yet." Akatsuki's ultraviolet imager will focus on inspecting theseenigmas. A bright mystery, and volcanoes? In2007, two-thirds of the Venus?s southern hemisphere was suddenly covered in abright haze that disappeared a few days later. It remains uncertain whatstarted this amazing transformation. "Wethink it's some kind of dynamic overturning of the atmosphere that injectedsulfur dioxide above the clouds briefly, but we're not sure," Grinspoonsaid. The clouds may be fueled from sulfur spewed up by volcanoeson Venus, as Grinspoon and his colleagues ran calculations that suggest thesulfur seen in the atmosphere should dissipate after 10 to 30 million years ifnot otherwise refueled. However, Venus's clouds are so thick that no one hasactually seen any volcanoes yet. "Venus guards her secrets rather tightly, and underforbidding conditions," he said. The scientists behind Akatsuki hope itscameras might be able to spot active volcanoes under her veil. When Akatsuki reaches Venus in December, it will find VenusExpress there as a partner in orbit, complementing it in a number of ways. For instance, they will take different orbits over the planet —while Venus Express has an orbit that takes it over both poles, enabling it tosee virtually the entire world, Akatsuki will fly an elliptical orbitaround the equator, allowing it to concentrate on parts of the atmosphere forhours at a time. The orbit will bring Akatsuki as close as 186 miles (300 km)to Venus and as far away as 49,709 miles (80,000 km). "VenusExpress and Akatsuki are like sister satellites, and a very good cooperativerelationship has been built as we have progressed in our missions,"Imamura said. 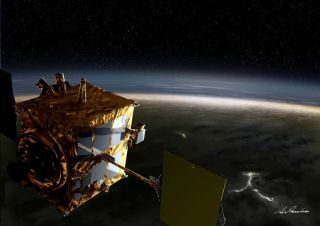 Imamura said that while Venus Express primarily studies thechemical composition of Venus' atmosphere, Akatsuki will focus on the fluidmotion of the planet's weather. Together, the two spacecraft should reveal acomprehensive picture of how the planet works. "If there's one thing we've been learning about Venus, it'sthat it's a really dynamic planet that's very changeable, so we need as muchlong-term data as we can to build up an understanding of how things change overtime," Grinspoon said. "Having Akatsuki there should help capturemore vital clues to understanding Venus's mysteries."